charge with the purchase of this print! Last of the ninth, bases loaded, two out. Your team will win the game if you get this batter out. You run the count to 3 and 2. Eyes on the target, you wind up and throw your best pitch...a fast ball. He swings and misses! 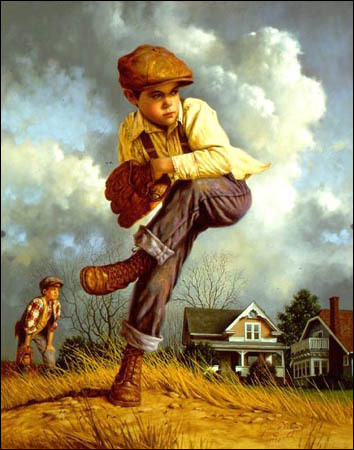 Jim Daly captures a moment every little boy dreams about in Fast Ball, a nostalgic scene based on his own childhood. "I have fond memories of playing baseball in an old vacant lot on the outskirts of town," says Jim. "Like lots of kids, the heroes of my youth were the great baseball players of the past." 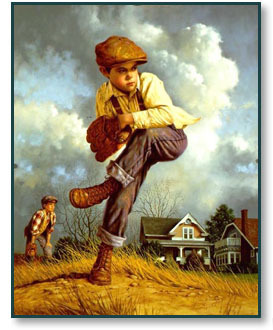 Fast Ball copyright © 2002 by Jim Daly is prohibited from being copied.